Just when I thought I was ready to kick that cold in the hoohoo, I came down with pink eye. Or I *thought* I had pink eye. Dr. Eye Doctor told me that I did not in fact have pink eye, but dry eyes. Apparently the combination of our dry mountain air, my excessively long days wearing contacts, and lots of computer time has caused great irritation and distress to the insides of my eyelids. I was instructed to take a break from wearing contacts to give my eyes a rest lest I not be able to wear contacts in the future. Trying not to sound like a brat after my scolding, I inquired how long “a break” was. He gave me the side-eye and said, “Until your eyes feel better.” Before I could ask another stupid question he continued, “That might be a day or it might be a week. You will have to gauge, but don’t push it – be kind to your eyes.” I gave it a day and another day and a third day and I’ve noticed considerable improvement. As dull as it was to exercise on the indoor bike trainer (the only place I could work out and not hurt myself when my glasses steamed up), it was a much needed opportunity to get a lot of computer work done and organize my freezers – woohoo! And I let my body truly recover from the cold and not relapse by heading out into frigid winds and blowing snow. Of course, now that I’m healthy again, I’m going to do exactly that – go straight into the frigid winds and blowing snow. Hey, it’s ski season on the Front Range! It is what it is. Besides, there’s nothing like being sick to make you appreciate being healthy. This week’s recipe is offered as a main dish suggestion for holiday dinner parties or the actual holidays. If there is any time to roast a hunk of meat it would be on the darkest nights as we enter winter. 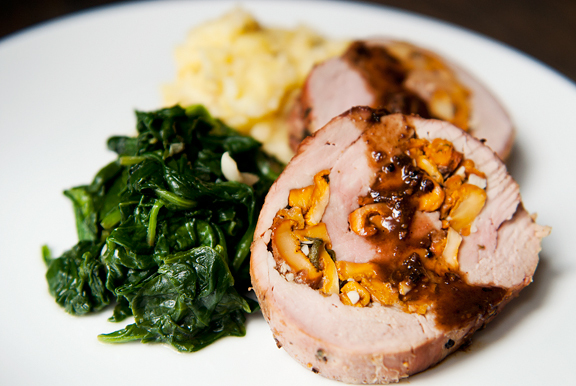 Ah, but this isn’t just any hunk of meat – it is stuffed with earthy, delightful mushrooms. 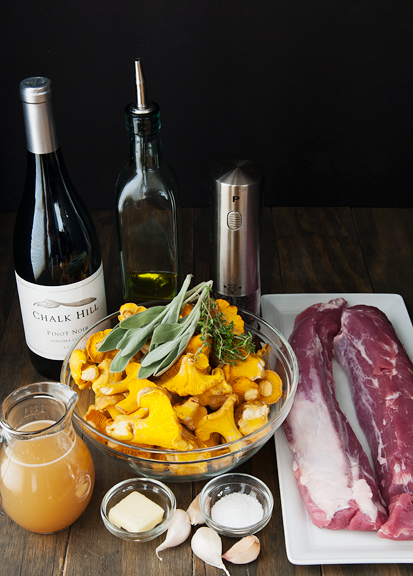 I’m using foraged chanterelles here, but you can use whatever fresh mushrooms are available to you in your neck of the woods: shiitakes, crimini, oysters – something with flavor and character. 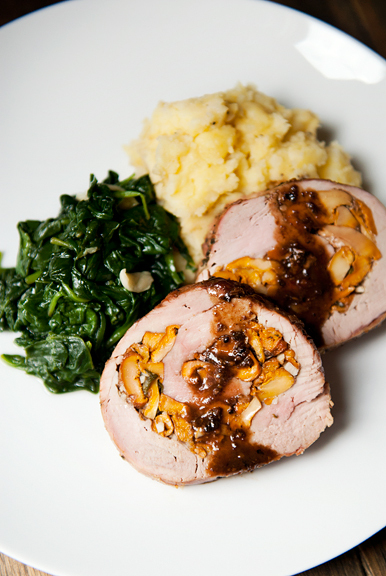 Could you make this with beef tenderloin (or flank steak) instead? Yes. Yes you could. The only reason I went with pork was because these were sitting in the chest freezer back in October when I shot the recipe. 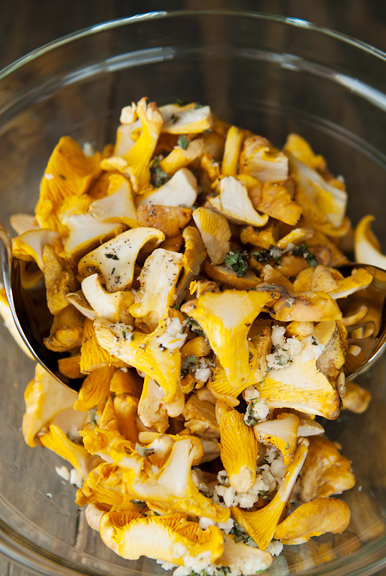 The stuffing is simply roasted mushrooms with some aromatics and seasonings. Use the recipe as a guideline. 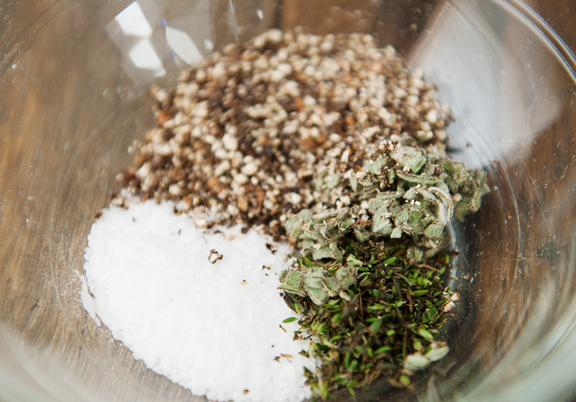 If you have other herbs and seasonings that you prefer, then go for it. At this point, I just want you to be happy. When I originally pulled the packaged tenderloin out of the freezer, I thought it was one whole tenderloin weighing about two and a half pounds. Only after I had thawed the pork did it become clear that these were two separate tenderloins. 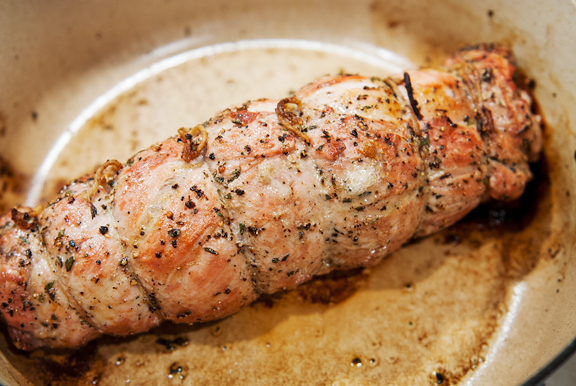 Okay, I thought, I’ll just make two stuffed tenderloins. Problem was that each one was too small to get much of a stuffing spiral, so I made one big roll with the two pieces. Worked just fine. 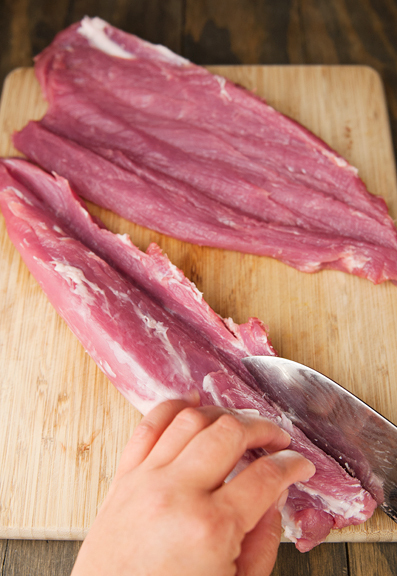 To butterfly the meat, you can slice the tenderloin lengthwise down the middle without cutting it into two pieces. It will resemble a book that you open up. Then you can pound it with a meat tenderizer to a quarter inch thickness. I prefer to slice it lengthwise like I’m unfurling a rug, about an inch thick. I’ve seen sushi chefs do this with cucumbers. My way is far less pretty or skillful. Don’t worry if the thickness of the pork is uneven, because you will still pound it to a quarter inch thickness with a meat tenderizer. If you are working with two tenderloins, arrange them tetris-like so that they best resemble a rectangle without any holes in the middle. I oriented them wide end to tapered end with a little overlap at the edges (raw meat has an amazing affinity for sticking together). 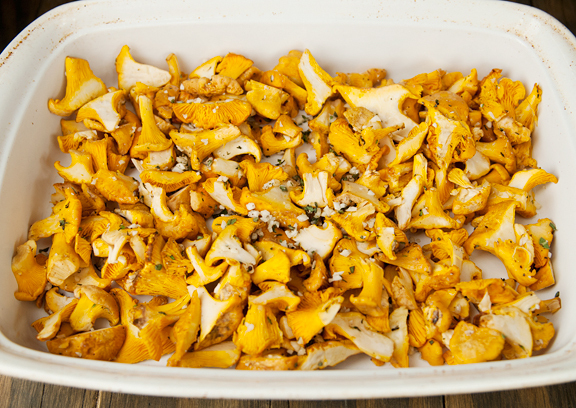 Distribute your mushroom filling over the “rectangle” leaving an inch of margin from all of the edges. This keeps your mushrooms from escaping as you roll. 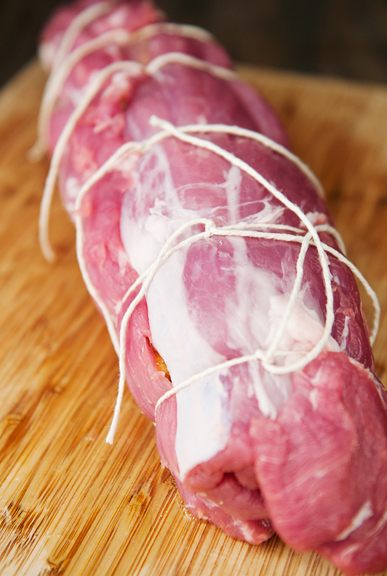 From a long edge (because we want a log shape, not a stump shape), roll the tenderloin up tightly, then tie the roulade off with kitchen string. Mix the rest of the herbs and spices to make a rub. Sprinkle and rub this all over the roulade. In order to sear the tenderloin on the stove, you’re going to have to find an overproof pan that is wide enough to accommodate the roulade. Mine just barely fit in my wide-shallow Le Creuset Dutch oven. 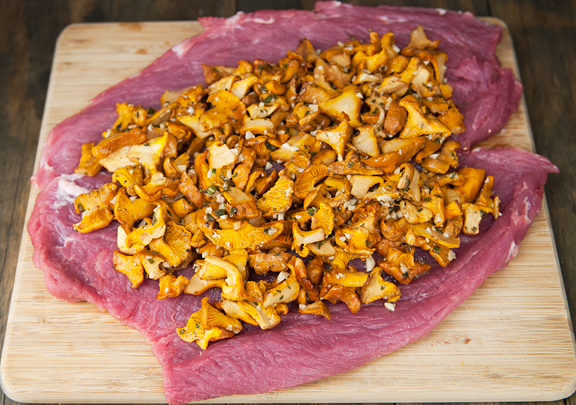 Once each side is seared, put the pan with the tenderloin into the oven and roast it until done. A meat thermometer is handy at this point, because it allows you to measure a safe internal temperature without roasting every last bit of juiciness from the pork. Tent the pork under foil for a few minutes while you make the pan sauce. That’s right – don’t even THINK of washing out that roasting pan! All of the flavorful goodies stuck to the pan are a pain to wash, but an absolute delight to eat if you just add some stock, wine, and butter. Pan reductions also make cleanup much easier. 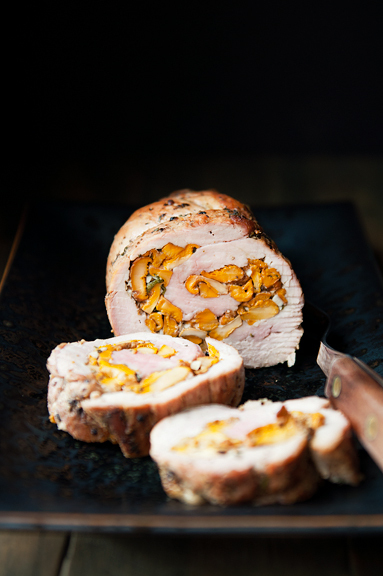 Once you get the hang of the technique, it’s really quite easy to make this mushroom-stuffed pork roulade. 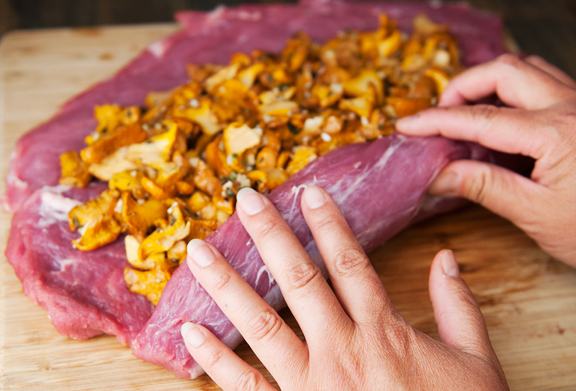 If serving at a party, you can roast the mushrooms and roll the tenderloin ahead of time, keeping it refrigerated until you are ready to cook. The actual cook time is no more than 30 minutes and the end result is as pretty as it is delectable. 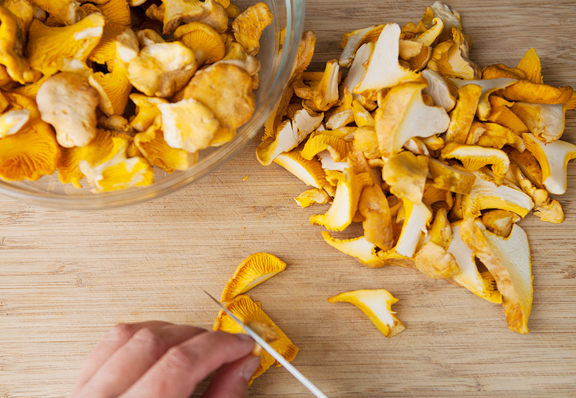 * If you are using fresh shiitake mushrooms, trim and discard the stems as they are too tough. Preheat oven to 400°F. 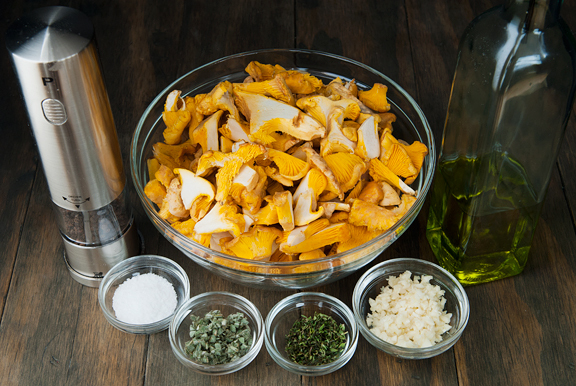 In a large bowl, toss the mushrooms, olive oil, garlic, 1/4 teaspoon black pepper, 1 teaspoon sage, 1 teaspoon thyme, and 1/2 teaspoon salt together. 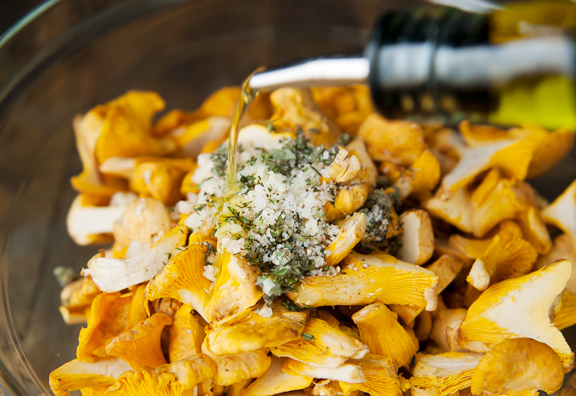 Pour the mushrooms into a roasting pan and roast for 5 minutes. 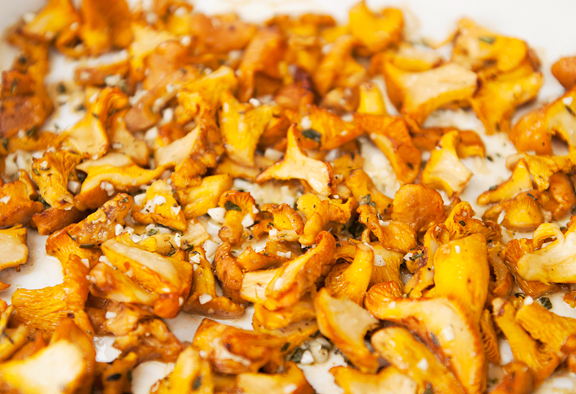 Stir the mushrooms around and roast for another 5-10 minutes until the mushrooms are fragrant and soft. Butterfly the pork tenderloins. There are two ways to do this. 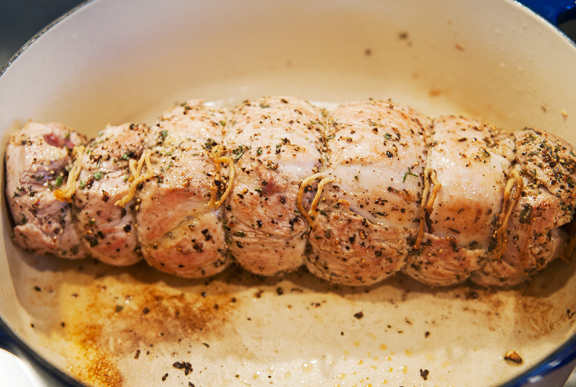 The method I used was to slice each tenderloin lengthwise as if unfurling a roll of paper towels, keeping the meat about 1-inch thick and in one continuous piece (resulting in two pieces because I used two one-pound tenderloins). Alternatively, you can slice the tenderloin lengthwise down the center, stopping about an inch shy of the other end (that is, don’t cut it into two pieces, keep it connected). 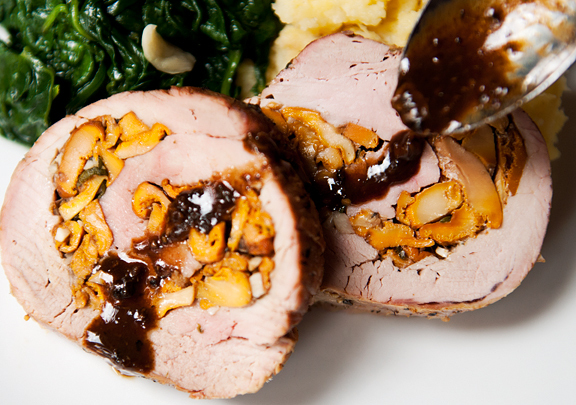 Open the tenderloin up like a book. 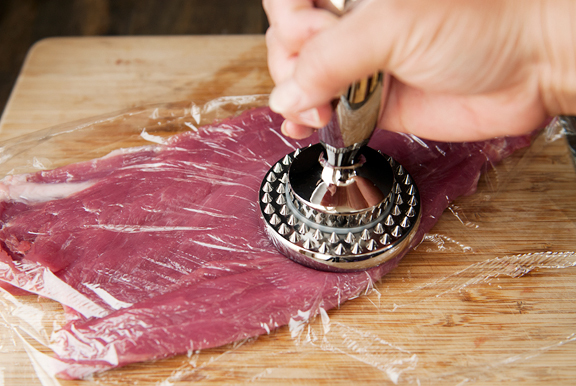 For both methods, cover the tenderloin(s) with plastic wrap and pound them with a meat tenderizer to about 1/4-inch thickness. If using two tenderloins, like I did, arrange them side-by-side and head-to-tail (the wide end of one should be next to the tapered end of the other) with a little overlap in the center to prevent any gaps. 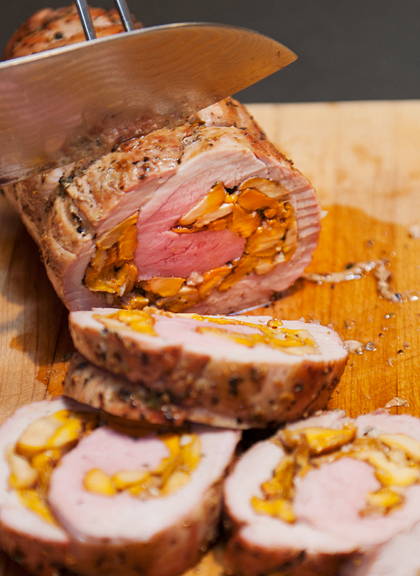 Spread the roasted mushrooms over the meat, leaving a 1-inch margin at the edges. 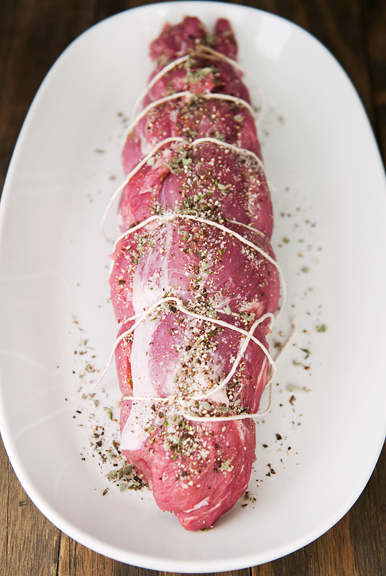 Roll the tenderloin up tightly from a long side (it should be a long roll, not a short one) and tie the roll closed with kitchen string every 2 inches. Combine the remaining two teaspoons of black pepper, 1 teaspoon sage, 1 teaspoon thyme, and 1 teaspoon salt. Rub the mixture over the tenderloin. Increase the oven to 450°F. Heat the vegetable oil in a large ovenproof pan over medium high heat. Sear the tenderloin on all sides for about 3-5 minutes total. Place the pan in the oven and roast to an internal temperature of 145°F (about 15-20 minutes). Remove from the oven and let sit under a foil tent on the cutting board for 5 minutes. Set the roasting pan over medium high heat and add wine, stirring and scraping up the browned bits on the bottom of the pan. 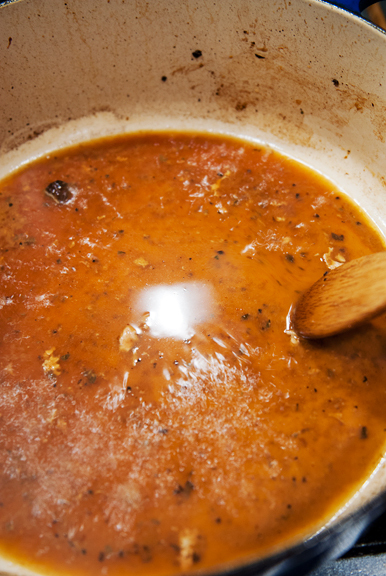 When the liquid has reduced by half, add the stock and reduce by half. Stir in the butter. Reserve the sauce to serve with the pork. Slice the pork and serve with sauce. Serves 8. A beautiful pinwheeled pork roll! Looks very yummy! Sorry about your eyes. I too suffer from dry eyes. Drops will become your friend. Hope you are all better soon. Oh boy what a joy ! Definitely on my to do list! Definitely ! Thank you and have a pleasant day ! Hey Jen…Just to let you know that I made this last night, using shitake mushrooms, and it was divine! Also, in looking up this recipe to print it out again (it got somewhat smutzig during the cooking process!) I discovered the link to your treasure trove of recipes. Somehow I hadn’t noticed it previously, diving into your most current emailing upon receipt and am happy to have them so easily accessible without scrolling through my back emails. You and Ina Garten are my “go to” gals for yummy dishes!